Unfolding after the battle with his father, Zeus , Kratos has moved on and tried to lay his past to rest. He's a father again, but in a new land. Centered around Norse Gods and their mythology, the new story starts. However, true to nature trouble finds Kratos, only this time he has to juggle fatherhood, the secrets he is carrying and the battles that lay ahead. 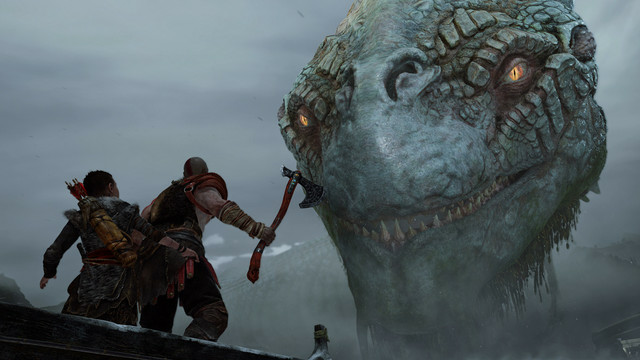 This isn't the old God of War, the battle system has change. Taking away the button mashing of old and bringing in an in depth combo system that requires some thought as some enemies require different approaches. Also you will have the assist of his son Atreus, which will become a critical part of the battle system. You can control some of his actions, as well as level his skills to make him a more powerful aide. There are lots of skills to unlock and upgrade, and plenty of gear to have crafted and equipped. Veterans of the series will find some familiarity with this new entry, but will find there is still a lot to learn. It's easy to pick up and play, quick to learn what works on whom. To me this entry likens more towards a "Dark Souls" type game than the God of War of old, which in my opinion is a great thing. The battles are fast and brutal and there are still stun kill moves which at first are great, but then kind of get boring. There are only a handful of true "Boss" battles, but plenty of frustrating Mini-Bosses to deal with. With the upgrade system you will find yourself grinding for XP to buy skills and busting every crate or vase you see for the in-game currency called hacksilver to upgrade gear, even materials to create new gear. Learning how to juggle between your attacks and Atreus' abilities is pretty simple though, the controls are set up in a way that it feels natural. Story wise, God of War is DEEP. There is plenty to discover, lots to learn and a somewhat overwhelming amount of things to see. This entry features an open world-ish style, where you can take on side quests or just adventure or proceed with the main story. Even the random conversations between the two while venturing forth are quite well done. There are a vast amount of secrets to learn, everyone seems to have them, and as they come out you get those "AH HA" moments where things start making sense. The story has plenty of twists, and leaves you wanting to know more. This is more than the old revenge driven story as before, this game is set up with a very in depth story that pulls you in, showing a different side of Kratos we've not seen. You'll put plenty of hours into the main game, and even more if you choose to do the side quests and chest and item hunting. The game is BEAUTIFUL, everything looks just wow (bear in mind I played on a PS4 Pro) it's plain to see that a lot of time was put into making the game look as good as the story. The sights and the sounds also play into the story so it's not just there to look good. The only downfall is there is little replay value. Once you're finished the story there are things left to do, like free the Valkyries, and side quests that you may not have gotten to. This is done not through a New Game + system or anything, once you finish the main story the game just continues. The credits scroll by while you're finishing the final cut scene and it takes you back to the beginning area. The side quests, while having somewhat of a "story" of their own, add nothing to the overall story and there's nothing to unlock that affects the story or gives you anything "extra". Unless you're a completionist or trophy hunter, there might not be anything that compels you to continue. I could see some DLC later down the road that may add something more, or in the off chance they add some sort of multiplayer aspect. As it sits, for me it's a one and done game. But well worth it, great story, beautiful game, once I finished the story I more than felt I got my money worth out of it. The God of War has returned, and lives up to the hype.